This year’s raffle grand prize is a $600 gift certificate to Stewart Leathers. Stewart Leathers is a local leather shop creating, altering and repairing quality leather goods through out the Pacific Northwest. Mainly known for their motorcycle riding gear they also create other leather goods as well!Aside from the grand prize, there will be several other prizes to be won from this same drawing. Everything from $100 Visa gift cards to ABATE event T-shirts. Get your tickets before its too late! 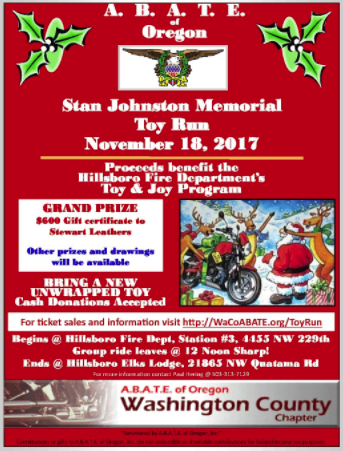 Drawing to be held at the Hillsboro Elk’s Lodge on November 18th following our annual toy run parade through Hillsboro, OR. Need not be present to win.